Yes, I said "Christmas" and not "Secular Winter Holiday That's Been Celebrated Under Many Names Since the Dawn of Man" get over it. That said, this is NOT a holiday shopping guide (though I'll probably have one of those up in a few days), but rather a nice collection of ways you can support your favorite comedians while buying the gifts you were going to buy anyway. Basically, everyone who has a podcast has some kind of affiliate deal with Amazon, so if you click these links and then do your shopping as usual, you're supporting the podcast and the comedian with a tiny percentage of the sale and you don't have to pay any extra. And you can basically buy any product ever on Amazon, so, you know, that mumu for Aunt Helen can make Pete Holmes a couple bucks, that toaster for your M-I-L can put some change in Ari Shaffir's pocket, I think you can even buy stuff like soap and shampoo for yourself (or your really dirty friend). So, have at it. Also, if you didn't realize, this is also implicitly endorsing these as my favorite podcasts, so subscribe and listen if you aren't already. Ari Shaffir's Skeptic Tank has become basically my favorite podcast this year. There's a great episode (and follow-up) with Sarah Tiana about the "Special Forces" guy who scammed her and a bunch of other women. There's a killer two-parter talking to members of the hacktivist collective Anonymous. Great comedy talk with Bert Kriescher, Kevin Christy and Steve Simeone. And some very deep episodes about self-cutting, childhood molestation and Brody's trip to the UCLA psych ward. So, listen in and support Skeptic Tank on Amazon. You made it Weird with Pete Holmes is basically my other favorite podcast. The two faves are very different, but strikingly similar in their honest and funny exploration of basically the human condition. I already wrote up why and which episodes are my favorite so check that out. And I'll add the recent Bret Ernst episode was super fabulous. 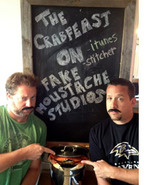 The Crab Feat with Jay Larson & Ryan Sickler. Listen for the bahstin accent alone! This one is only about 6 months old, but it's charming, funny & fun with lots of great guests (I'm a big fan of the Tom Segura & April Macie episodes, especially). Okay, and since this is an implicit thumbs up on these podcasts, just know there are others I love dearly and listen to regularly, they just have other sponsors. And really, what are you doing Christmas shopping at Stamps.com?